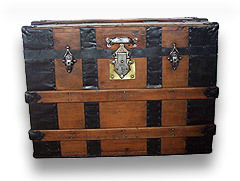 Need ideas on what you could do with one of Connie's Trunks? 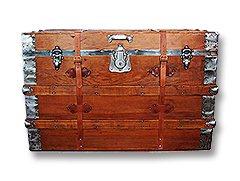 About Our Trunk Prices: All of our pricing includes insurance, packing, and shipping to any of the 48 contiguous United States. 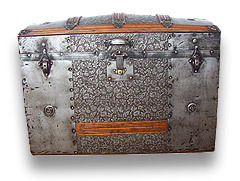 Occasional additional shipping and handling charges (if there are any) due to trunk weight, size, or other special considerations will be clearly indicated with the trunk write up. See "Shipping" below for more details. 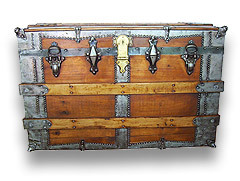 "We absolutely loved the trunk we purchased for our son and daughter-in-law! I wished you could have seen their faces when they opened their gift. My son was awestruck and my daughter-in-law immediately began to cry. 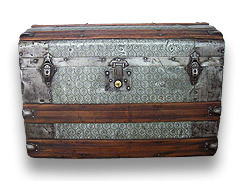 Once they read about the trunk's history that you included, they couldn't stop looking at all the beautiful details and commented how amazing the condition was. Difficult to believe that it survived from the 1800s. It was beautifully restored and they loved the color! It is definitely an heirloom that they will treasure and their children to come. 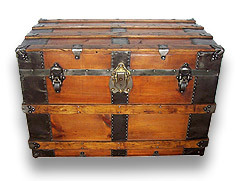 "Connie, we received the second trunk yesterday and it is also wonderful. As I mentioned it will go into our 1924 Laguna Beach cottage that we are restoring. 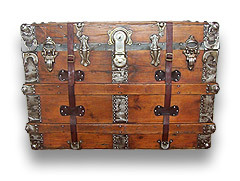 Thanks again for everything, the trunks truly are beautiful." 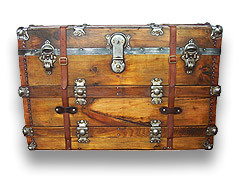 Shipping and handling via UPS to any of the US's contiguous 48 states is included in the price of the trunk. If you want it shipped outside the USA or to Alaska or Hawaii, or have special delivery requirements, call us before you make your purchase (either online or through the mail) for an estimate of additional shipping charges.